do I have bitter jealousy in my heart? We saw those who are wise show it by their behavior and deeds in the gentleness of wisdom. God’s wisdom is all about our lifestyle. It marks whether or not we belong to Jesus. We are brought into God’s wisdom through faith in Jesus Christ, and then the Holy Spirit teaches us God’s wisdom. We will begin to LOOK at this wisdom that is not of God, digging into the root of it, beginning with jealousy. Oh Lord, we come to Your Word today, hungering to know and understand Your Truths. Give us ears to hear and eyes to see. Help us to grasp hold of what You are saying to us. And let us walk in the light of what You teach us. Thank you. Let GODcha point the way. Where will you start off? Read James Ch 3, verses 13-18, asking the 5W’s and H.
You might read out loud as you will not only see the Word, but saying it and hearing it helps you remember it. Let’s just reflect a minute on what James has said, in verses 14-16. What is at the root of this wisdom that is NOT from above, NOT of God? What does this wisdom NOT from above produce? Let’s zoom in on v14. What characteristics, words, are key to this verse? Let’s check out these characteristics which are key. Bitter, pikrós; Metaphorically it means bitter, cruel, malignant (James 3:14, indicating bitter, harsh, cruel feelings). Jealousy, zeâlos; it is a zeal in an unfavorable sense. Meaning envy, anger, resentful. Heart, kardía; the thoughts or feelings (mind). Values, affections or passions are attributed to the heart or mind. TIP: Now take the definitions back to the text. Let’s LOOK and LISTEN carefully to what God says about these characteristics. 1. Who is full of bitterness? The context of Rom 3:9-20: is describing those who are under sin. In contrast: those who are UNDER sin, are NOT righteous, thus are NOT believers. Understand: Bitterness is a characteristic of those who are NOT righteous, thus, meaning – not saved. 2. What is bitterness connected to? What is to be done with bitterness? We see: Because bitterness causes trouble and defiles, believers have put it away. Thus, bitterness is connected to those who have NOT been made righteous. Have I been made righteous and put away all bitterness, wrath, anger, clamor, slander and malice? Am I kind and forgiving? Or, am I still under sin, not righteous, and my mouth is full of cursing and bitterness? If full of bitterness, who or what do I harbor harsh, cruel feelings towards? Why? Do I speak harsh, cruel words that spring from anger, designed to wound or injure others? What must I do to put bitterness away from me, and be on guard against the dangers of bitterness? 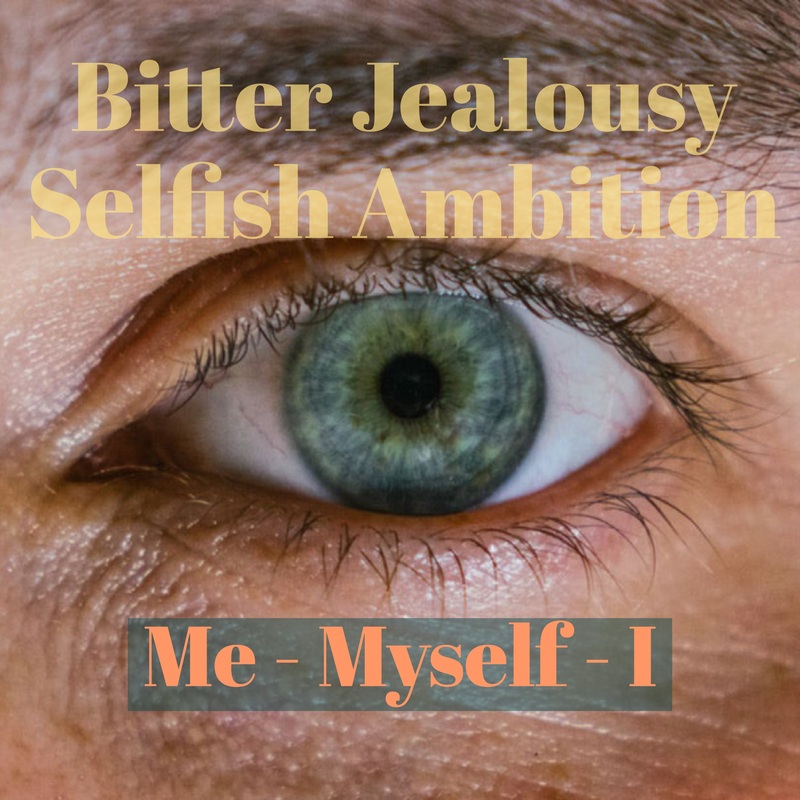 What is jealousy associated with? What does jealousy lead to? We see: Jealousy is a deed of the flesh, preventing one to inherit the kingdom of God. Do I have bitter jealousy in my heart? If so, why? Who am I jealous of? Who do I envy? Resent? Why? Have I been guilty of seeing others and/or other ministries as a competitive threat to me? Why? What has my jealousy led to? 4. What did jealousy trigger and provoke? You might use GODcha‘s Word Search. Search ‘jealous‘, ‘jealousy‘, and/or ‘envy‘ to see what else God says about jealousy. Rachel became jealous of Leah, Gen 29 and 30. Joseph’s brothers became jealous selling him into slavery, Gen 37. Aaron and Miriam became jealous of Moses. The Lord turned Miriam leprous for her sin, Num 12. Saul was jealous of David, becoming David’s enemy, 1Sa 18. The Corinthian church became jealous of each other, (1Co 3:3-4; 10:22; 13:4). We’ll look at ‘selfish ambition‘ next time. Reflect — think about what God just showed us about bitterness and jealousy. God loves you. Talk to Him! As we close for the day remember, take a minute to put the Definitions and Cross References not only in your Notes but also in your hardbound Bibles next to Jam 3:14-16. FATHER, YOU ARE THE WISE GOD WHOSE UNDERSTANDING IS INFINITE, knowing each one of us and our hearts, wanting to turn us from the error of our ways and save our souls from death. Oh Father, let the light of Your Word shine upon our hearts. May we be willing to take an honest self-examination. Oh Father, show us our hearts and do not let us be deceived. Do we profess faith, yet our hearts are filled with bitterness, jealousy and envy? Oh Father, please forgive us. May we be willing to hear Your Word, see ourselves and our hearts. May we confess and repent! Cleanse our hearts and minds this day. Please purify us. Help us! Oh Holy Spirit make us more like Christ, our beloved Lord and Savior in whose name we ask these things. Amen! Rest and worship the Lord! In a couple of days we will continue to LOOK at these characteristics of this ‘wisdom that is NOT of God’.